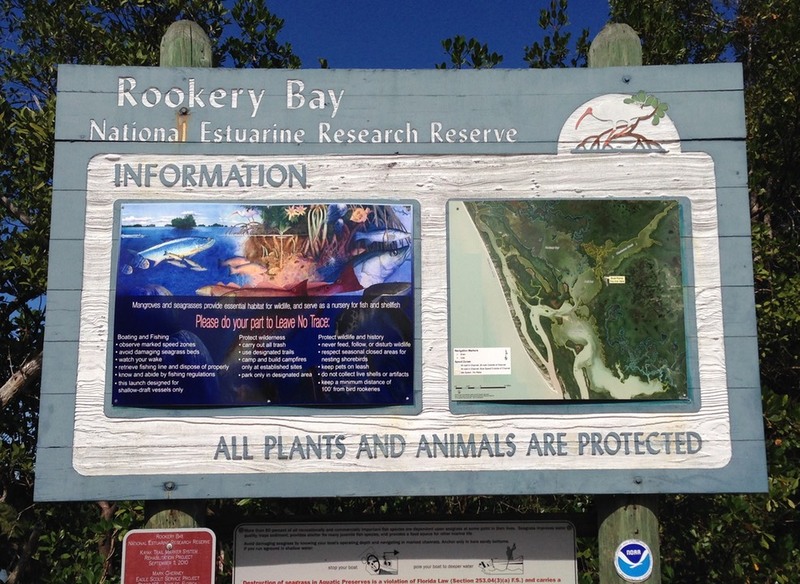 On our way to the Shell Island Launch for the third time, Bruce and I stopped at the Rookery Bay Environmental Center and had a good conversation with the director. 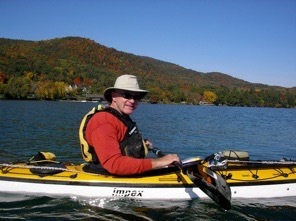 In discussing various paddling options, he recommended paddling Henderson Creek, noting that it passed by the Center itself. Alan was waiting for us when we arrived at the launch site. Soon we were on the water and heading for Henderson Creek. It was a glorious day, much different than the day before. Bright sun, blue skies. light breeze and lots of wildlife. 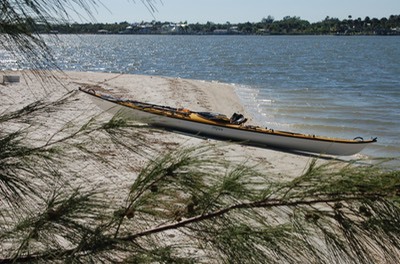 Bruce even got a “Florida Sleigh Ride” when he paddled over a sleeping manatee. Once past the Rookery Bay Environmental Center we began to see signs of human habitation. We came to what we considered to be a dead end at Belle Meade. But while deciding to turn around we began talking with a snowbird couple living in a big diesel pusher RV, with an enormous Great Dane. The dog was big, but sweet and gentle too. We had a great conversation with the couple before heading back down the creek to the Shell Island Launch and lunch. 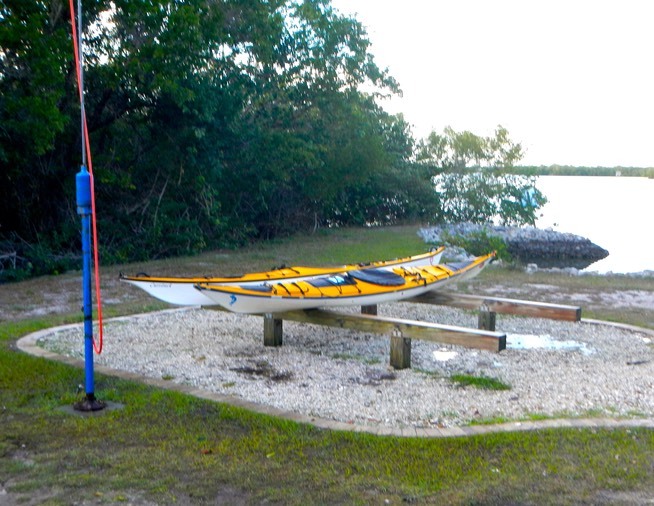 After a break for lunch on the far side of Marco Island, we headed for the Isles of Capri Paddlecraft Park, again on Rookery Bay. 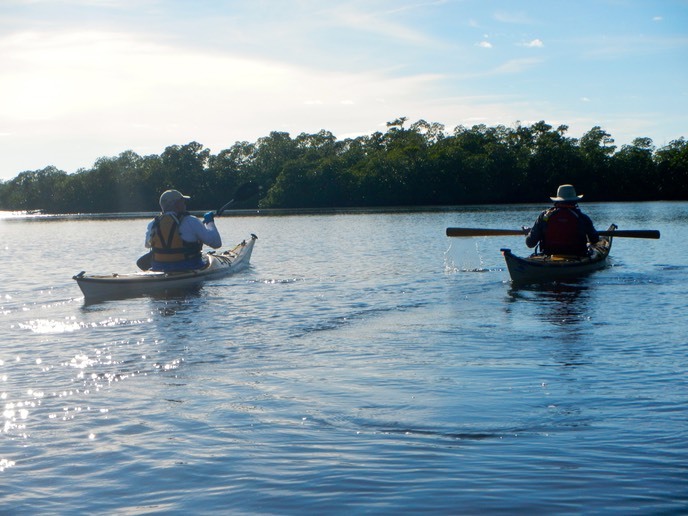 Rookery bay is quite large with several excellent access points and this was one of the best if you consider facilities specifically designed for paddlecraft. 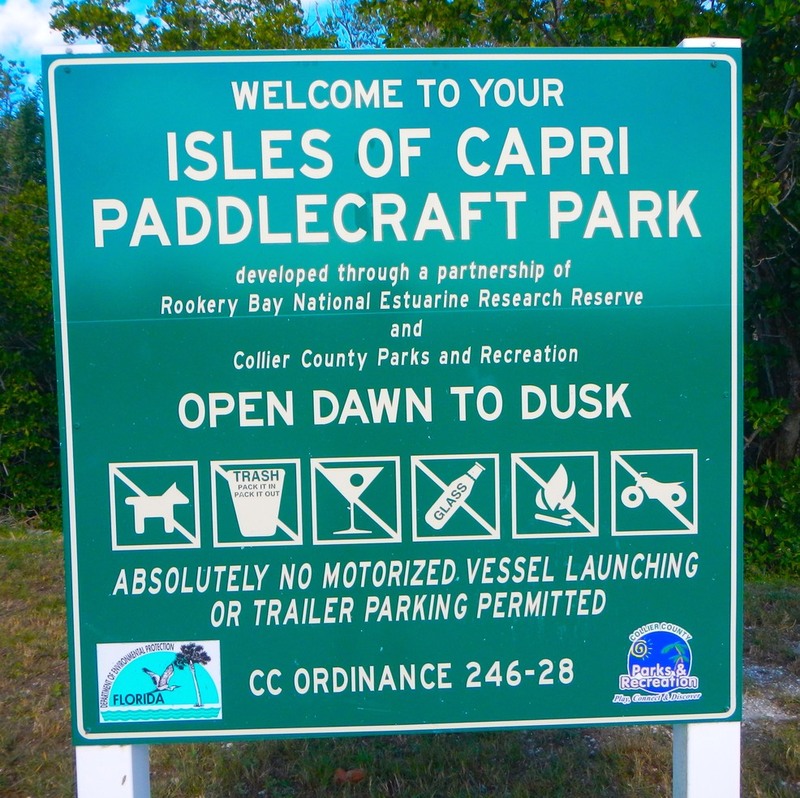 First, unlike so many public launch areas, there were no motorized craft allowed. 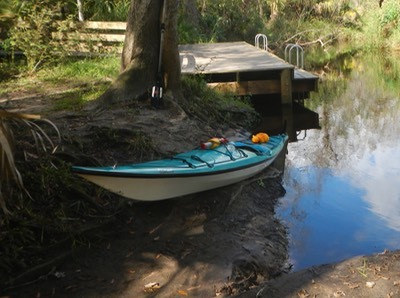 Most “official” public launch sites are designed for powerboats, with paddlecraft an after thought, if they were considered at all. 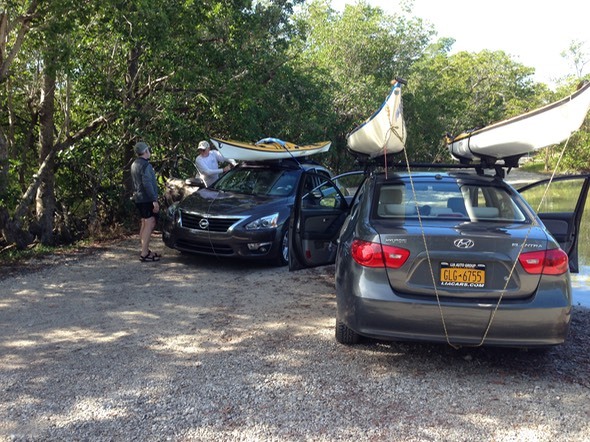 Here, a user friendly drop off with a nearby parking lot made unloading and loading the boats easy. Second the launch deck featured a plastic grid embedded in a hard sand bottom which gave good traction for launching. Finally, and best of all, this location had a feature I’ve only seen at saltwater powerboat launch sites for powerboat use; a paddle craft washing station. We didn’t feel like second class citizens or interlopers at this site! 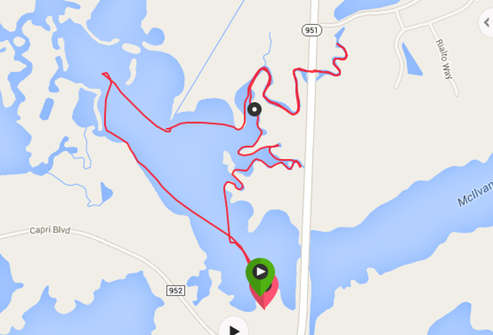 Our rout for this late afternoon paddle. It was close to 2:30 before we were ready to paddle again. The map above makes it look like we covered a lot of ground, but we really only covered 4.4 miles in about two hours. We paddled a bit faster on average than on our other trips (2.6 MPH) and got back to our launch point a bit after 5 PM, as it was getting dark. Those readers who live in the northern parts of our country may not understand that sundown here in South Florida happens like turning off a light. There is no long twilight here as there is in the North, so making it back to our launch point while it was still light was a priority in this unsettled mangrove wilderness. Our paddle took us on a more or less circular rout in a small bay between McIlvane and Johnson Bays. It was the last paddle of the trip for me. It was good to have a peaceful trip in a beautiful place to end with. Back at the launch we took advantage of that rinse station to wash the salt and sand off our boats before heading home, Alan back to Ft. Meyers, Bruce and I back to Naples before my trip home the next day.